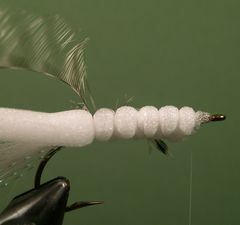 The Gartside Gurgler is another example of an innovative fly that utilizes closed cell foam. It's a great bass fly. According to William Tapply, author of Bass Bug Fishing, this fly was created by Boston's Jack Gartside, both famous and notorious as an innovative fly tier, globe-troting angler, reconteur, and poker shark. "Jack's Gurgler is a staple among East Coast striped bass and bluefish anglers, writes Tapply, but he also catches tarpon and bonefish on Gurgler Variations. However, he designed it originally for freshwater bass." 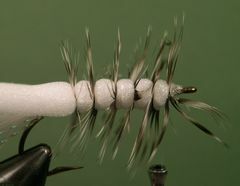 The Gurgler in the tying sequence is the way Tapply ties it and his tie is very similar to the way Gartside ties the fly. I like to use the Mustad 3366 for my Gurglers but you can use any standard straight-eye bass bug or saltwater hook. The hook used in the tying sequence is a Mustad 3366 in size 2. Any tier with average tying skills will have no problem following the step-by-step instructions that appear in the tying sequence that follows. If you would like to tie more of Jack Gartsides creations check out his web site on the "Web Links" page. Once you are there, go to the site map on the navagation bar and click on fly patterns. To learn how to tie these knots click on "Warmwater Knots." Fish the Gurgler like you would any other popper. 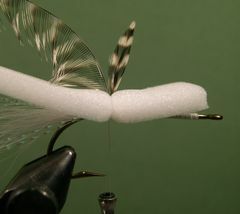 But be sure to attach the fly to the leader with a Duncan Loop (Uni-Knot) or a Non-Slip Mono knot. Clamp the hook in the vicie, crimp the barb, and start the thread slightly behind the hook's eye. Lay down a base of thread from the hook's eye back to the hook's bend. 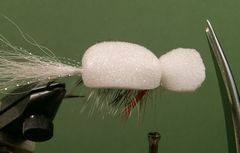 Tie in a sparce bunch of white Bucktail fibers. The tail should be about one and one-half the length of the hook. Tie in four to six strands of Krystal Flash on each side of the tail. The Krystal Flash strands should be slightly longer than the tail. Prepare a piece of 1/8th inch closed cell foam that is 1/2" wide and 3" long. Lay the foam strip on top of the hook's shank with the front of the strip behind the eye. Bind down the back of the strip at the hook's barb. 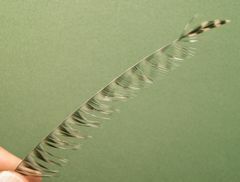 Prepare a long soft saddle feather by stripping the fibers from one side of the stem. 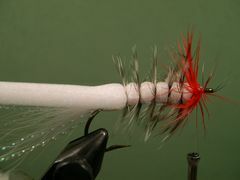 Bind down the feather by the tip with the curved side facing the hook's shank. Coat the thread wraps on the hook's shank with super glue. Bind down the foam with 1/8th inch wraps to the end of the foam. Bind down the front of the foam strip and leave about 1/8th inch of space to attach the gills. Notice the tip of the feather that has been bound down as you made the wraps of thread. Wrap the saddle hackle forward through the space created by the thread wraps. Tie off the feather and remove the excess. 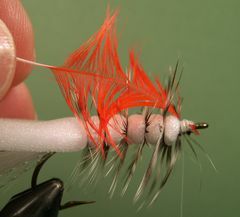 Tie in a red feather, by the tip for the gills, with the curved side of the feather facing the hook's shank. In this case I'm using a soft hen neck feather but any soft read feather will do. Take two or three turns of the red feather to make the gills. Tie it off and remove the excess. At this point your thread should be hanging slightly behind the hook's eye. Pull the foam strip forward and bind it down with several wraps of thread. Bring the thread forward to just behind the hook's eye and tie it off with a couple of half-hitches or a whip finish. Clip the excess foam strip so that you end up with a lip that's about one-half inch long. Round off the lip with your curved scissors. Your Gartside Gurgler is finished.